Saw that last night, I wonder why he won't be at the opening round? Shame that there doesn't appear to be an entry for Warren Scott, I thought he did really well last year. Godfrey will switch to a Spencer Sport run Mitsubishi Mirage for Silverstone. Didn't think the Mirage looked that quick last year, but it was in the hands of a relatively inexperienced driver then, so perhaps it will fare better now. I wonder why he's in that rather than the Fiesta? Presumably that means that Grint won't be competing this year? I guess Spencer Sport are trying to give the car some exposure so that someone else will run it for the rest of the year? I hope it's used by someone at Lydden - I haven't seen it in the flesh yet but it looks like a tidy car. ...but it wasn't challenging for any race wins. Of course Grint wasn't the most experienced driver which could have been a factor. Not sure I'd be too reassured by the fact its now running a JGE engine. His previous non-Ford engines haven't always been that reliable. It might be a homologation thing? Or more likely Godfrey is taking over the development of the engines and stuff. The Mirage is a full Supercar? Or one of those Polish cars with extra power? Would think they are using a JGE engine under the "custom" rules. Really hope he does well this year. 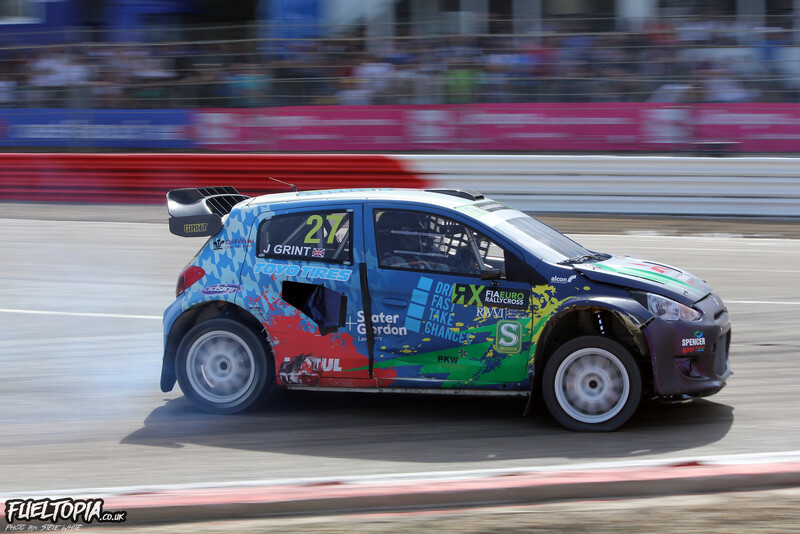 Higgy is a class above most rally drivers int he UK, let alone rallycross. only obvious disadvantage is his lack of rallycross experience. Live timing and results from Silverstone if anyone is interested. Normally I come on here and say I've had a cracking day at the races, unfortunately I can't say that this time. To think that Silverstone had the chance to come up with a brand new track from scratch, it really dose boggle the mind to think that's the best they could do! Its awful. A few plus points from the day, Jack Thorne in the SET Promotions Renault Twingo was just amazing, no one could touch him all day and his commitment on the jump was stunning. Also too see the Works Peugeot & Audi squads there was great, those cars are just sumthing else and shows the difference between a Supercar and a full works Supercar. What was the track like for spectating? Could you get all around the track or only specific areas? Are you close to the track or miles away? I was watching from the Stowe building close to the jump, from which we could see the whole track and were approx 20 metres from the action. Which is closer than I had feared. There were places that you could get closer, particularly along the start finish straight but the view of some parts of the track was compromised from there. The track grew on me throughout the day and the joker merge created some close finishes. But it can't touch Lydden or the other old school tracks on the World RX calendar (and some of the new ones to be honest) and IMO there's too much loose / mud which limits the excitement in wet conditions, as it was for the early heats today. For the World round I would imagine the Stowe building we were based in will be used as some kind of 'Media Centre' etc and I'm struggling to imagine the existing grandstands and spectator infrastructure dealing with the crowd numbers Silverstone will be hoping for. The whole arena felt very underwhelming when you think it's supppsed to be hosting "Speedmachine" in a couple of months.